I got a few boxes in the mail…………..
……………..and you might recognize where they are from! Dingy storage pockets? Interesting. Can’t wait to see these. My Bride might be getting another project. Are you making the stack pack from scratch or did you buy a kit? We have a Dutchman system on our boat and I keep wishing I had a stack pack instead. It’s just had to justify all the work and the money when we have a decent shape mainsail cover and the Dutchman system. But I would really like the convenience of the stack pack. The dingy storage pockets are to help tame the crazy piles of stuff we put in our dingy; snorkle gear, spearing gear, anchors, look bucket, fish bucket, dog, drinks, gas, more drinks… They are still yet to be designed so I can’t wait to see them either! So, if your bride has any ideas, I’m listening! Stack pack-I bought the sailrite PDF instructions (about 5.00, I think) but am going to be doing some pretty major customizing. We don’t have a choice we had to install the stack packs, with the enclosure we can’t even reach parts of our boom. It’s pretty unsafe to reef or bring down the main at the moment. We had Dutchman on our Ericson and loved them. Infact, we now kind of wish that we had them installed when we had the mainsail made. Oh, well. By the way, you can have both the Dutchman and a stack pack, you just can’t have the one continuous zipper on top. Just a thought for when your sailcover starts to go. 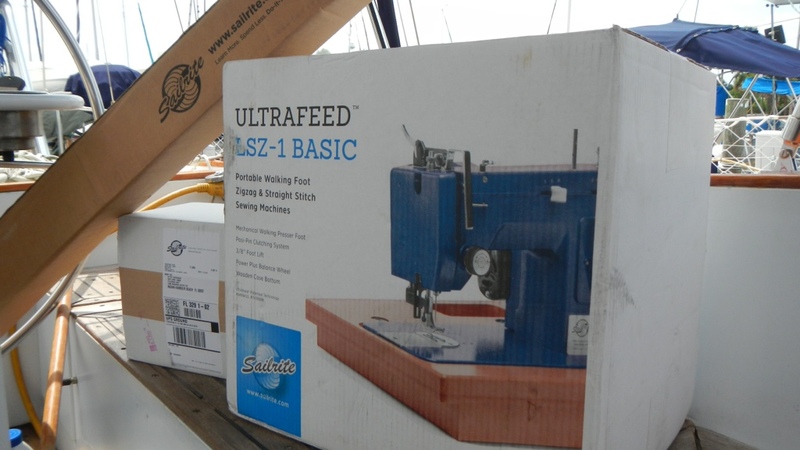 I have to confess that I am drooling just looking at the sewing machine box. lol. I love your website. Keep up the good work.